Food isn't just food, it can be medicine! A plant-based, whole-food diet can help prevent chronic diseases, while also promoting a healthy weight. This isn't just a modern concept that's supported by today's science, but a knowledge that's deeply entrenched in our collective food history. Master Plants Cookbook, from the founder and chef for Naked Food© magazine, takes you on a fascinating journey of discovery that spans ancient civilizations, and links the wisdom of our ancestors with the magnificent power of foods we can still enjoy today. The plants and grains that these ancient cultures grew, ate, and thrived on remain the most powerful foods for our own optimum health. And by incorporating these 33 "Master" plants into your diet-from avocados, lentils, and beets to sweet potatoes, blueberries, and chia-you can benefit from their detoxifying, immune-boosting, health-promoting powers. 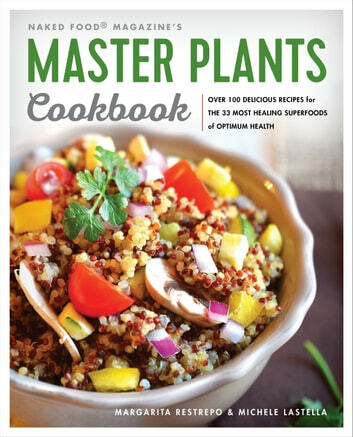 With more than 100 delectable and easy recipes including "Himalayan Rice," "Machu Picchu's Quinoa Cookies," and "Incan Mango Pudding," Master Plants Cookbook draws on the best of ancient traditions to spark a new love for real, organic cuisine that packs a powerful healing punch. Whether you are already well on the road to a plant-based way of eating, or just need a little push, Master Plants will empower you to eat your way to your healthiest, most radiant self.